ENHANCE COOKING EXPERIENCE: Deco Express® Copper Stone frying pan combines the highest culinary technology with unique style to create unsurpassed heat conductivity and culinary elegance. Allows for quick and even heat diffusion as well as enhancing the natural flavours of the food cooked in it. HEALTHY COOKING : This frying pan is the perfect addition to your copper kitchen accessories. This High Performance Non -Stick System Copper Pan enables Healthy Dry Fry without Oil or butter! EXTREMELY DURABLE : The ultimate tool in everyday cooking, Deco Express ® Copper frying pan is a versatile essential, perfect for intensive daily use. 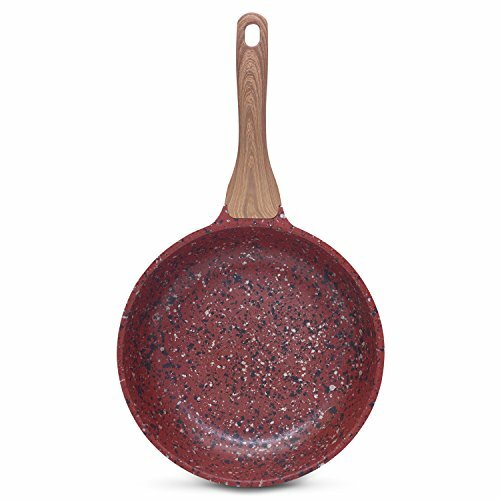 It features a tough, PFOA-free non-stick surface inside and out, and a special hardened body to create a durable and long-lasting pan that can be used on any heat source. LIMITED TIME OFFER: For a limited time ONLY we offer The New Technology Free Standing heat-resistant glass lid for FREE when you buy The Deco Express ® Copper Pan . Made from 3.8 mm toughened glass, the Free Standing Lid retains moisture and flavour and allows you save storage space in the kitchen. SAVE £14.99 ! Great quality and value. Love the material and the handle on the lid.